Learn About Different Types of Flowering Plants. 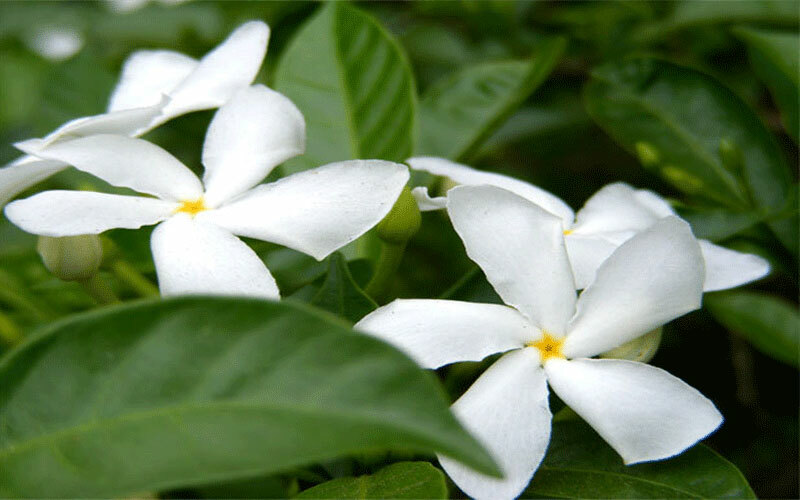 Pinwheel Jasmine is a fragrant semi tropical evergreen shrub that is native to tropical Asia. 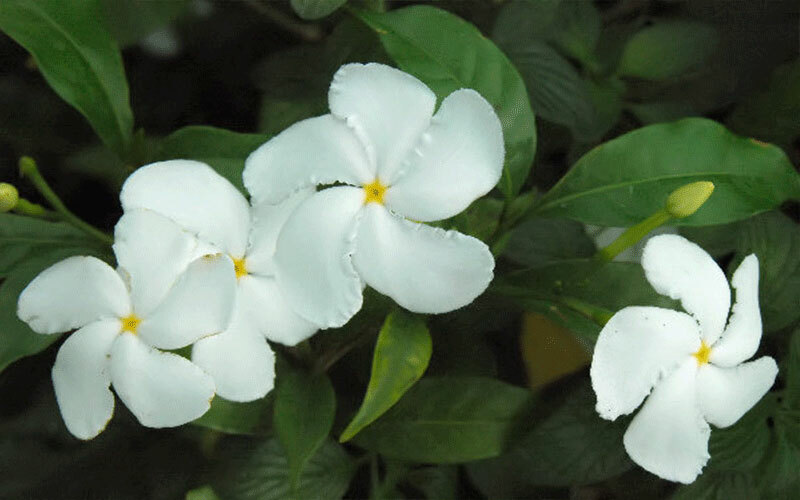 It is known by several other common names, including Crepe Jessamine, and Butterfly Jasmine or Gardenia. 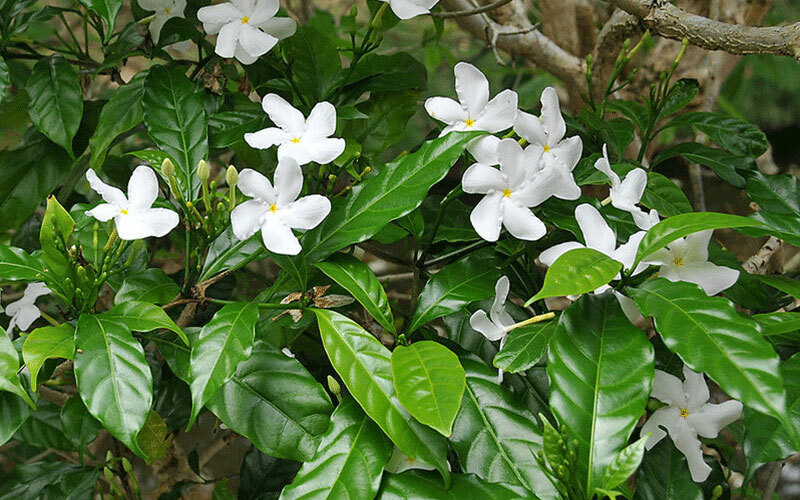 This plant is not a true Jasmine, but is commonly called a Jasmine because the flowers are Jasmine like and have a similar, but lighter fragrance. 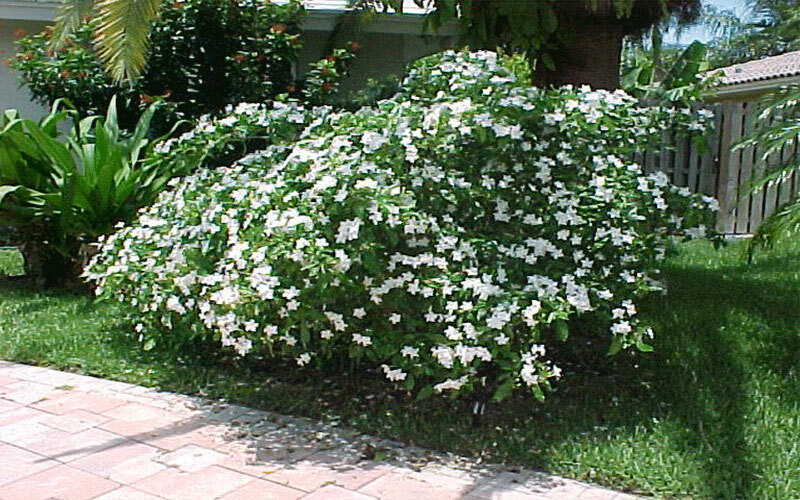 Pinwheel Jasmine matures at about 6 ft. tall and has a horizontal open growth habit. The leaves are elongated and deep glossy green. For the deepest green color and gloss, locate Pinwheel Jasmine in a location that is lightly shaded in the afternoon. Plant in spring, summer, or fall, spacing plants 2 feet apart or closer if you want a hedge line. Dig a hole only as deep as the root ball and 2 to 3 times as wide. If your soil is in very poor condition, amend the soil you've removed from the hole with a small amount of compost. Otherwise don't amend it at all. Carefully remove the plant from the container and set it in the hole. Fill the hole half full with soil, then water it well to settle the soil and eliminate air pockets.This shrub can take full sun but seems to prefer part sun to partial shade, and will bloom on and off all year no matter what kind of light it gets. A moderate grower, it can grow to 5 feet though you can easily keep it 3 feet tall. Trim occasionally to shape no hard pruning is necessary. Fertilize in spring, summer and autumn with a god granular fertilizer, adding supplemental feedings of bone meal and/or liquid fertilizer for heavier bloom.